Genesis are proud to once again feature in the Rock and Roll Hall of Fame library. Ringo Starr’s PHOTOGRAPH, Mick Rock and Lou Reed’s TRANSFORMER, and Eric Clapton’s SIX-STRING STORIES are the latest titles to be housed in the prestigious archives. Visitors can browse the books from January 31st – click here for more details. 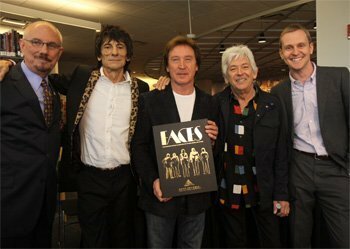 Pictured left: Ronnie Wood, Kenney Jones and Ian McLagan at their 2012 induction, with Nick Roylance and Rock and Roll Hall of Fame Museum President and CEO Terry Stewart.